Wæs þā ān gereord on eorþan, and heora ealre ān sprǣc. Hī fērdon fram ēastdēle oð þæt hī cōmon tō ānum felde on þām lande Sennar, and þēr wunedon. Ðā cwǣdon hī him betwȳnan, “Vton wyrcean ūs tigelan and ǣlan hī on fȳre.” Witodlīce hī hæfdon tigelan for stān and tyrwan for weall-līm. And cwǣdon, “Cumað and utan wircan ūs āne burh and ǣnne stȳpel swā hēahne ðæt his rōf ātille þā heofonan, and uton mǣrsian ūrne namon, ǣr þan wē bēon tōdǣlede tō eallum landum.” God þā nyþer āstāh, þæt hē gesēga þā burh and þone stȳpel þe Adames sunus getimbroden. God cwæð þā, “Efne þis his ān folc and gereord him ealum, and hī ongunnon þis tō wircenne; ne hī ne geswīcað heora geþōhta, ǣr þan þe hī mid weorce hī gefyllan. Cumað nū eornostlīce and uton niþer āstīgan and heora gereord þēr tōwendon, þæt heora nān ne tōcnāwe his nēxtan stemne.” And God þā hī tōdǣlde swā of þǣre stōwe tō eallum landum, and hī geswicon tō wyrcenne þā buruh. And for þī wæs sēo burh gehāten Babel, for þan þe ðǣr wæs tōdǣled þæt gereord ealre eorþan. God þā hī sende þanon ofer brādnesse ealra eorðan. Forsothe the lond was of o langage, and of the same speche. And whanne thei ȝeden forth fro the eest, they fonden a feeld in the lond of Sennaar, and dwelliden ther ynne. And oon seide to his neiȝbore, "Come ȝe, and make we tiel stonys, and bake we tho with fier," and thei hadden tiel for stonus, and pitche for morter; and seiden, "Come ȝe, and make we to vs a citee and tour, whos hiȝnesse stretche `til to heuene; and make we solempne oure name bifor that we be departid in to alle londis." Forsothe the Lord cam down to se the citee and tour, which the sones of Adam bildiden. And he seide, "Lo! the puple is oon, and o langage is to alle, and thei han bigunne to make this, nethir thei schulen ceesse of her thouȝtis, til thei fillen tho in werk; therfor come ȝe, go we doun, and scheende we there the tunge of hem, that ech man here not the voys of his neiȝbore." And so the Lord departide hem fro that place in to alle londis; and thei cessiden to bielde a cytee. And therfor the name therof was clepid Babel, for the langage of al erthe was confoundide there; and fro thennus the Lord scaterede hem on the face of alle cuntrees. And the whole earth was of one language, and of one speach. And it came to passe as they iourneyed from the East, that they found a plaine in the land of Shinar, and they dwelt there. And they sayd one to another; Goe to, let vs make bricke, and burne them thorowly. And they had bricke for stone, and slime had they for morter. And they said; Goe to, let vs build vs a city and a tower, whose top may reach vnto heauen, and let vs make vs a name, lest we be scattered abroad vpon the face of the whole earth. And the LORD came downe to see the city and the tower, which the children of men builded. And the LORD said; Behold, the people is one, and they have all one language: and this they begin to doe: and now nothing will be restrained from them, which they haue imagined to doe. Goed to, let vs go downe, and there cōfound their language, that they may not vnderstand one anothers speech. So the LORD scattered them abroad from thence, vpon the face of all the earth: and they left off to build the Citie. Therefore is the name of it called Babel, because the LORD did there confound the language of all the earth: and from thence did the LORD scatter them abroad vpon the face of all the earth. Now the whole earth had one language and the same words. And as they migrated from the east, they came upon a plain in the land of Shinar and settled there. And they said to one another, "Come, let us make bricks, and burn them thoroughly." And they had brick for stone, and bitumen for mortar. Then they said, "Come, let us build ourselves a city, and a tower with its top in the heavens, and let us make a name for ourselves; otherwise we shall be scattered abroad upon the face of the whole earth." The Lord came down to see the city and the tower, which mortals had built. And the Lord said, "Look, they are one people, and they have all one language; and this is only the beginning of what they will do; nothing that they propose to do will now be impossible for them. Come, let us go down, and confuse their language there, so that they will not understand one another's speech." So the Lord scattered them abroad from there over the face of all the earth, and they left off building the city. Therefore it was called Babel, because there the Lord confused the language of all the earth; and from there the Lord scattered them abroad over the face of all the earth. At first, the people of the whole world had only one language and used the same words. As they wandered about in the East, they came to a plain in Babylonia and settled there. They said to one another, "Come on! Let's make bricks and bake them hard." So they had bricks to build with and tar to hold them together. They said, "Now let's build a city with a tower that reaches the sky, so that we can make a name for ourselves and not be scattered all over the earth." Then the Lord came down to see the city and the tower which they had built, and he said, "Now then, these are all one people and they speak one language; this is just the beginning of what they are going to do. Soon they will be able to do anything they want! Let us go down and mix up their language so that they will not understand each other." So the Lord scattered them all over the earth, and they stopped building the city. The city was called Babylon, because there the Lord mixed up the language of all the people, and from there he scattered them all over the earth. NRSV Then the LORD God said, "It is not good that the man should be alone; I will make him a helper as his partner." Good News Bible Then the Lord God said, "It is not good for the man to live alone. I will make a suitable companion to help him." KJ And the LORD God said, "It is not good that the man should be alone: I will make him an helpe meet for him." Wycl And the Lord God seide, "It is not good that a man be aloone, make we to hym an help lijk to hym silf." OEH God cwæð ēac swylce, "Nis nā gōd ðisum men āna tō wunigenne; uton wyrcean him sumne fultum tō his gelīcnysse." NRSV So out of the ground the LORD God formed every animal of the field and every bird of the air, and brought them to the man to see what he would call them; and whatever the man called every living creature, that was its name. Good News Bible So he took some soil from the ground and formed all the animals and all the birds. Then he brought them to the man to see what he would name them; and that is how they all got their names. Basic English And from the earth the Lord God made every beast of the field and every bird of the air, and took them to the man to see what names he would give them: and whatever name he gave to any living thing, that was its name. KJ And out of ye ground the LORD God formed euery beast of the field, and euery foule of the aire; and brought them vnto Adam, to see what he would call them: and whatsoeuer Adam called euery liuing creature, that was the name thereof. Wycl Therfor whanne alle lyuynge beestis of erthe, and alle the volatils of heuene weren formed of erthe, the Lord God brouȝte tho to Adam, that he schulde se what he schulde clepe tho; for al thing that Adam clepide of lyuynge soule, thilke is the name therof. OEH God sōðlīce gelǣdde ðā nȳtenu, ðe hē of eorðan gescēop, and ðǣre lyfte fugelas tō Adame, ðæt hē forescēawode hū hē hī gecȳgde. Sōðlīce ǣlc libbende nȳten, swā swā Adam hit gecȳgde, swā is his nama. NRSV The man gave names to all cattle, and to the birds of the air, and to every animal of the field; but for the man there was not found a helper as his partner. Good News Bible So the man named all the birds and all the animals; but not one of them was a suitable companion to help him. Basic English And the man gave names to all cattle and to the birds of the air and to every beast of the field; but Adam had no one like himself as a help. KJ And Adam gaue names to all cattell, and to the foule of the aire, and to euery beast of the fielde: but for Adam there was not found an helpe meete for him. Wycl And Adam clepide bi her names alle lyuynge thingis, and alle volatils, and alle vnresonable beestis of erthe. Forsothe to Adam was not foundun an helpere lijk hym. OEH And Adam ðā genamode ealle nȳtenu heora naman, and ealle fugelas and ealle wildēor. Adam sōðlīce ne gemētte ðā gȳt nānne fultum his gelīcan. NRSV So the LORD God caused a deep sleep to fall upon the man, and he slept; then he took one of his ribs and closed up its place with flesh. Good News Bible Then the Lord God made the man fall into a deep sleep, and while he was sleeping, he took out one of the man's ribs and closed up the flesh. KJ And the LORD God caused a deepe sleepe to fall vpon Adam, and hee slept; and he tooke one of his ribs, and closed vp the flesh in stead thereof. Wycl Therfore the Lord God sente sleep in to Adam, and whanne he slepte, God took oon of hise ribbis, and fillide fleisch for it. OEH Ðā sende God slǣp on Adam, and ðā ðā hē slēp, ðā genam hē ān rib of his sīdan, and gefylde mid flǣsce ðǣr ðæt rib wæs. NRSV And the rib that the LORD God had taken from the man he made into a woman and brought her to the man. Good News Bible He formed a woman out of the rib and brought her to him. Basic English And the bone which the Lord God had taken from the man he made into a woman, and took her to the man. KJ And the rib which the LORD God had taken from man, made hee a woman, & brought her vnto the man. Wycl And the Lord God bildide the rib which he hadde take fro Adam in to a womman, and brouȝte hir to Adam. OEH And geworhte ðæt rib, ðe hē genam of Adame, tō ānum wīfmen and gelǣdde hī tō Adame. NRSV Then the man said, "This at last is bone of my bones and flesh of my flesh; this one shall be called Woman, for out of Man this one was taken." Good News Bible Then the man said, "At last, here is one of my own kind---Bone taken from my bone, and flesh from my flesh. 'Woman' is her name because she was taken out of man." Basic English And the man said, This is now bone of my bone and flesh of my flesh: let her name be Woman because she was taken out of Man. KJ And Adam said, "This is now bone of my bones, and flesh of my flesh: she shalbe called woman, because shee was taken out of man." Wycl And Adam seide, "This is now a boon of my boonys, and fleisch of my fleisch; this schal be clepid virago, for she is takun of man." OEH Adam ðā cwæð, "Ðis is nū bān of mīnum bānum and flǣsc of mīnum flǣsce; bēo hēo gecīged fǣmne, for ðan ðe hēo is of hyre were genumen." NRSV Therefore a man leaves his father and his mother and clings to his wife, and they become one flesh. Good News Bible That is why a man leaves his father and mother and is united with his wife, and they become one. Basic English For this cause will a man go away from his father and his mother and be joined to his wife; and they will be one flesh. KJ Therefore shall a man leaue his father and his mother, and shall cleaue vnto his wife: and they shalbe one flesh. Wycl Wherfor a man schal forsake fadir and modir, and schal cleue to his wijf, and thei schulen be tweyne in o fleisch. OEH For ðan forlǣt se man fæder and mōdor, and geðēot hine tō his wīfe, and hī bēoð būta on ānum flǣsce. NRSV And the man and his wife were both naked, and were not ashamed. Good News Bible The man and the woman were both naked, but they were not embarrassed. Basic English And the man and his wife were without clothing, and they had no sense of shame. KJ And they were both naked, the man & his wife, and were not ashamed. Wycl Forsothe euer eithir was nakid, that is, Adam and his wijf, and thei weren not aschamed. OEH Hī wǣron ðā būta, Adam and his wīf, nacode and him ðæs ne sceamode. This may be simply illustrated by a diagram, in which the three factors involved whenever any statement is made, or understood, are placed at the corners of the triangle, the relations which hold between them being represented by the sides. The point just made can be restated by saying that in this respect the base of the triangle is quite different in composition from either of the other sides. Between a thought and a symbol causal relations hold. When we speak, the symbolism we employ is caused partly by the reference we are making and partly by social and psychological factors---the purpose for which we are making the reference, the proposed effect of our symbols on other persons, and our own attitude. When we hear what is said, the symbols both cause us to perform an act of reference and to assume an attitude which will, according to circumstances, be more or less similar to the act and the attitude of the speaker. Between the Thought and the Referent there is also a relation; more or less direct (as when we think about or attend to a coloured surface we see), or indirect (as when we 'think of' or 'refer to' Napoleon), in which case there may be a very long chain of sign-situations intervening between the act and its referent: word---historian---contemporary record---eye-witness---referent (Napoleon). Between the symbol and the referent there is no relevant relation other than the indirect one, which consists in its being used by someone to stand for a referent. 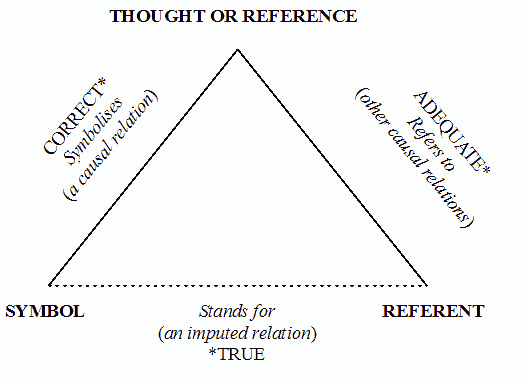 Symbol and Referent, that is to say, are not connected directly (and when, for grammatical reasons, we imply such a relation, it will merely be an imputed, as opposed to a real, relation) but only indirectly round the two sides of the triangle. It may appear unnecessary to insist that there is no direct connection between say 'dog,' the word, and certain common objects in our streets, and that the only connection which holds is that which consists in our using the word when we refer to the animal. We shall find, however, that the kind of simplification typified by this once universal theory of direct meaning relations between words and things is the source of almost all the difficulties which thought encounters. ・ Eco, Umberto. "The Meaning of The Meaning of Meaning." Trans. William Weaver. Introduction. The Meaning of Meaning. C. K. Ogden and I. A. Richards. San Diego, New York, and London: Harcourt Brace Jovanovich, 1989. v--xi. 1. Use an "S" to make a noun plural. 2. Adjectives can be extended using "-ER" and "-EST." 3. Verb can end in "-ING" and "-ED." 4. Adjectives become adverbs by adding "-LY." 5. "MORE" and "MOST" are used to talk about amounts. 6. "Opposite" adjectival meaning is expressed using "UN-." 7. To make questions use opposite word order and "DO." 8. Operators and pronouns conjugate as in normal English. 9. Two nouns (e.g. milkman) or a noun and a directive (sundown) make combined words (compounds). 10. Measures, numbers, money, days, months, years, clock time, and international words are in the British form, for example Date/Time: 20 May 1972 at 21:00. One day last May there was a rat in a hole. It was a good rat which took care of its little ones and kept them out of the way of men, dogs, and poison. About sundown a farmer who was walking that way put his foot into the hole and had a bad fall. "Oh," was his thought, when he got on his legs again, "a rat for my dog, Caesar!" Naturally the rat had the same idea and kept very quiet. After an hour or two, Caesar got tired of waiting, and the farmer put his spade over the top of the hole, so that the rat was shut up till the morning when there might be some sport. But the farmer's daughter, May, had seen him from her window. "What a shame," said May, "Poor rat! there is no sport in letting cruel dogs loose on good mothers! I will take the spade away. There --- the rat may go." Then she took the spade to her father: "See! your spade was out there in the field, and I went to get it for you. Here it is." "You foolish girl," was his answer, "I put that spade over a rat-hole till the morning and now --- the rat may go." (2) 古代ギリシア世界における koiné （コイネー）や中世ヨーロッパにおける俗ラテン語のように諸方言が接触した結果としての "contact language"
(4) Esperanto ([2011-12-15-1]) や Basic English ([2011-12-13-1]) のような補助言語（人工言語）たる "auxiliary language"
(5) カナダの小共同体で話されている，クリー語の文法とフランス語の語彙を融合させた，民族的アイデンティティを担った Michif のような "mixed language"